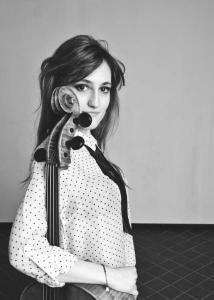 Martyna Wiśniewska, the new teacher in our Unisono Music School, is an outstanding cellist and artist. In spite of her young age she was awarded with prestigious awards at many cello contests in Poland and abroad. She won, e.g. the 1st Place at the International Cello Contest in Francavili Fontana (Italy). Martyna Wiśniewska is member of the Sinfonia Iuventus symphonic orchestra. She is a passionate cello teacher teaching both children and adult persons. Her special and subtle approach to teaching children makes the children more open to her instructions and the beauty of music. Her cello lessons are fully professional and deserve to be ranked as lessons on the highest artistic level. This is confirmed by her numerous achievements as a performer and teacher. Already as a young artist she was acclaimed a person with extraordinary talent and virtuoso abilities which was certified by the special stipend she obtained from the Ministry of Science and Higher Education in 2013 . She obtained her master’s degree at the I.J. Paderewski Music Academy in Poznań. She also won the 1st Prize at the International Contest in Francavilli Fontana (Italy). Afterwards she developed her artistic and pedagogic skills and mastered the Gordon’s method of teaching known as playing and auditioning . She introduced also her own innovative and creative elements into the classical methods of music teaching. Stipend granted by the Procello Foundation. Martyna Wiśniewska’s cello lessons are children-friendly without stress accompanying ordinary teaching methods. The pupils voluntarily participate in regular concerts which give them opportunity to develop self-confidence and gather scenic experience. This also stimulates pupil’s harmonious artistic development . These feature are essential elements in our School programs developed in the recent 10 year of our musical activity. Our program is rooted in the long-term experience of musical and pedagogic activity, confirmed by the excellent results our pupils achieve during exams at the ABRSM (Associated Board of the Royal School of Music). The timetable in our School is flexible and can be adapted to individual needs and possibilities of pupils. We welcome you to individual informative interviews and lessons. Lessons in our School are carried out in rooms prepared for music teaching equipped with all that is necessary and convenient for the children and teachers. You will find informations and contact possibility as well as our address under “kontakt”:file.